Welcome to Granite State College! If you're starting or returning to college, it's important to stay organized. 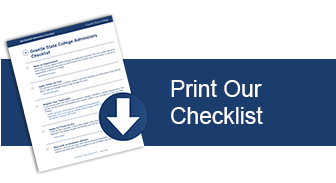 Here's a checklist to help you get started! Advisors are available to guide and support you. Whether you have general questions about applying, choosing a degree program, or financial aid, we are eager to assist. Advisors will also assist you with course planning and registration. Advisors are advocates - offering support as you complete you degree program. Complete the admissions application online with no application fee. If you have questions, your advisor will be able to help you navigate step-by-step through the application. If you earned credit from one or more previous colleges, make arrangements with these institutions to have your transcripts sent to Granite State College. This will kick off the process of evaluating your transfer credit so you can apply credits toward your degree at Granite State College. Financial Aid is available to help make college costs more affordable. Complete your Free Application for Federal Student Aid (FAFSA) and use the Granite State College code 031013. If you have questions, our expert financial aid team will be able to help you navigate step-by-step through the FAFSA. Tuition payment or documented payment arrangements (including financial aid) are due approximately 1.5 weeks prior to the start of term. Accepted students can pay online after creating their WebROCK account. We accept check, credit card, and money order payments. To view a complete list of deadlines, including payment due dates, visit our Academic Calendar.